My artwork is influenced by my origins. I was born in Santa Fe, New Mexico where the blend of Native American, Spanish and Anglo cultures is unique. I am a product of that environment. I am proud of that heritage and thankful for the voice it gives my work. I have always been fascinated by the Native American ceremonies and customs. My art is an expression of that intrigue. The beat of the drum, songs sung in ancient tongues, may you hear it through my artwork. My handmade paper is created from cotton, Abaca, and assorted fibers cut into small pieces and blended together with water. Color comes from the fibers themselves or from added pigments. After using a mold and deckle to form the sheets of paper the art takes shape on a vacuum table. The vacuum table extracts the majority of the water from the pulp, at that time I sculpt the piece into the desired shape. Once the piece is dry, I sew, paint and add adornments. I do not attempt to reproduce or duplicate actual Native American pieces. I create my own visions and include a touch of fantasy. 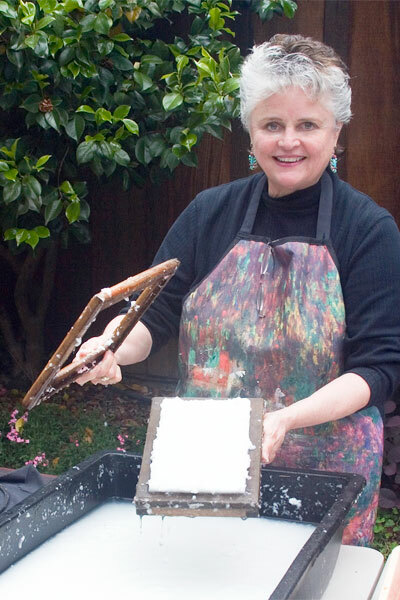 Most recently I have been exploring combining my handmade paper with encaustics. This age old technique of layering wax onto paper illuminates and enhances my art. Ancient Native Americans' aesthetic vision that beauty and function cannot be separated is evident in the art of their clothing. I believe my interpretation of that vision reflects the essence and spirit of a distant past.